*Disclaimer - I received the products in this post from Just Play Products, in order to facilitate this review for my readers. Are you looking for toys that'll bring back memories of Peter Rabbit? When you hear 'Peter Rabbit' and you're over 30 years old, you're thinking back to our childhood movie, aren't you? I know I sure was and I LOVE Peter Rabbit in every way! He was the best. Well, Just Play Products has brought some great toys onto their website from the new Peter Rabbit movie that came out not too long ago, and I just love them and our kids are going to absolutely love them too! I just know our toddlers will. 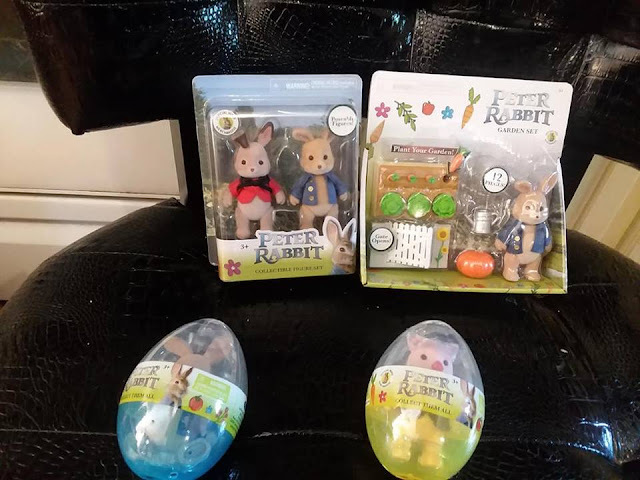 You can find the Peter Rabbit Garden Set, Peter Rabbit Figure in Egg Assortment, and the Peter Rabbit Collectible Figure Set, on the Just Play Products website. These are way too cute NOT to buy, I may even have to buy a couple more especially of the egg assortment. Kids nowadays don't see why their moms are so excited when the new Peter Rabbit movie came to theatres and now to DVD. Well, if you still have access to your parents old VHS tape if they kept it and can watch it in a VHS player, show it to your kids! I'm sure they'll LOVE it!